« No Generation — Happy Fish!…..Happier Fishers! 90s and lots of sun for the next three days. Monday and Tuesday, there is a chance (60%) for rain with temperatures dropping into the 80s. Slight chance on Wednesday, but temperatures back into the 90s. Low generation (30 mwh) in the morning for the past several days. At this mwh, the flow is only around 2000 cfs and the level is in the 703 range. Today they bumped it up earlier than they have been…think it was 10:00 a.m….. Tomorrow they are supposed to shut it down from 7:00 a.m. to noon. If they really shut the water down tomorrow, one better be out there wading when it get to a safe level. The few times they have completely shut it down, fishing has been awesome. Even at the low generation, (30 mwh) fishing has been very good. Stan on the water this past Sunday with Pete and his son, Alec. They had a great half day on the ruby 2, lightning bug, and tiger tail. It was so much fun, they scheduled another trip on Tuesday. Monday, James had Jim, from Kansas out for half a day. Fun day for Jim on the ruby 2, and a red San Juan worm. It was one of those days when the water stayed low, so they fished the rebar and rockin chair areas. Another good day for Pete and Alec with Stan on Tuesday. Even caught more this time. Tiger tail and lightning bug. Low flow day, so they stayed in the rockin chair area. Carolyn out with Jack and his grandson, Zac. Good day for them on the tiger tail and lightning bug. Picked a few on the floozie and a couple on the filoplume. Back to the water again for Carolyn, Jack and Zac on Wednesday. This was Zac’s day as he landed a nice rainbow. Another lightning bug and tiger tail day. When the water got to moving a little more, we pulled and caught on the holographic green crackleback until it got going too fast. James had Mike and Brian on the water and they had a very good day on the tiger tail and ruby 2. Tony and Christie were out with Stan. This was Tony’s first time with a fly rod and he did pretty darn good. They caught fish on the tiger tail and lightning bug. Early bird gets the worm. Gina and Wednesday Jim hit the water a little early this Wednesday due to the heat and projected flow. 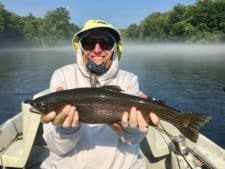 Jim landed a trophy, 21″ rainbow. They mainly pulled streamers all morning, the tiger tail, crackleback and a wooly bugger. 30 mwh is definitely wadeable, especially in the area down from the fish ladder. There were several waders out on Wednesday catching fish. 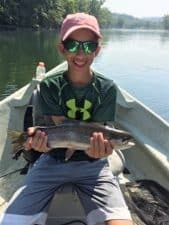 This entry was posted on Thursday, July 20th, 2017 at 4:00 pm	and is filed under Fishing Reports. You can follow any responses to this entry through the RSS 2.0 feed. You can leave a response, or trackback from your own site.